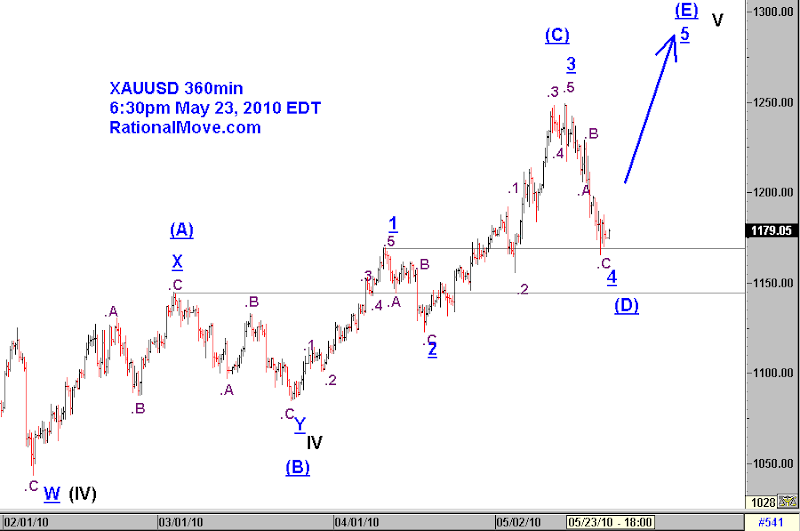 (a) Count the rally from Feb 5 to Mar 3 ($1044 to $1145) as wave 1 although it really looks zigzag. (b) Whether or not I adopt (a), since the current wave (black V of purple .III) is wave 5, it can be an ending diagonal instead of an impulse. It can make new high before reversing the trend in this case. Other market participants use other indicator Bollinger bands, RSI and etc. BB shows it slightly crossed the -1 sigma line, and pushed back higher from there. My impression from gold trading community has not yet turning the view completely…though it’s a subjective matter. I had set the stop loss for GLD ETF at 111 when I initiated the position, and it’s holding up. Besides, as far as I can see the chart on Google Finance page, the ETF value has not overlapped with the high of April 12 high just yet. I am risking less than 1% of the capital on this position since my mid term positioning based on Elliott wave is still experimental. So, please bear this background in mind, and don’t apply everything in your case if you have a position. While I am not going to increase the position size or recommend others to initiate a long position from here, I am not ruling out the possibility of gold making new high before seeing further descent. Considering my initial stop loss for GLD is set as 111, and the potential loss is less than 1% of the capital, I would hold this position for now. 1 comment to Is gold rally dying? Thankyou for your explanation, i get the point.